In my fifteen years as a writer, and with the exception of a few short stories, my work has always taken place in the 21st century. I have recently completed my fourth novel with all the advantages and disadvantages of modern technology. Mobile phones, for instance, with their instant access when really it would be much easier on the plot if contact couldn’t be immediate. How often can one pull the ‘no signal’ card? On the other hand, emails and instant messaging can and have proved a real asset at times. But with no new plot thrusting itself to the front of my mind I wondered about changing my time setting. I looked at some of my short stories for inspiration. I thought of those authors I most like to read. Not all were contemporary. 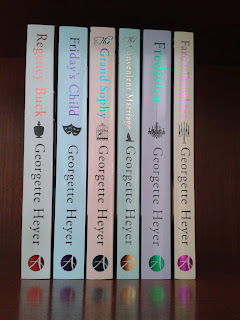 Georgette Heyer was almost my first love and most of my copies of her books have disintegrated over time. Frederica fell to pieces when I dropped her in the bath! Sadly I don’t think she’s still available with the old green cover. A seed was planted and I ordered six books. More will follow. Then there’s Jane Austen. I never got on with Emma but Pride and Prejudice, Sense and Sensibility and Persuasion are long-standing favourites. Could I write a Regency novel? What about the future? One of my stories, Beyond the Fringe, a sci-fi, appears in the anthology Fusion. I had a lot of fun with that one and it still makes me smile but a whole book? I think not. Continuing to rifle through my short stories I found another that appeals and which I feel sure I could convert into a time-slip. The thought both attracts and terrifies me but what is writing without a challenge? So…am I procrastinating? Absolutely not! I will continue to ‘play’ for a while longer until one of the now several ideas buzzing in my head shouts ME! Then the work will truly begin. After all, with contemporary romance I have had the luxury of minimal and accessible research. This new venture, if indeed I move out of my comfort zone, will take time and a huge amount of hard work and planning. For someone who is normally a pantster the thought is terrifying – but at the same time incredibly appealing. Regency/Time-Slip. Time-Slip/Regency. I’m hoping one of them will call loudly and strongly in the next few days. A brave move, if you decide to take it. I like sticking with what I know. Good luck, Natalie! All the best with it, Natalie. It's scary trying something so different, but at least if you do go for the Regency there are a lot of wonderful resources online to help with the research. I'm IN that genre, Natalie - and I'm a Georgette Heyer addict too. I still have my original hardback copy of Frederica - it comes out every year. I'm very happy staying in the historic genre, and fine it reasonably easy to get the words down. Whether I could do it in a contemporary genre - i really don't know. Good luck with whatEVER genre your writing takes you to. After going to Mireille Weller's talk and demonstration on Sunday afternoon on Victorian clothes I realise how many potential pitfalls there are just getting those details right (I would do Regency not Victorian but the principle's the same). As we all know, get it wrong and someone will notice. I knew I could get you to plan a novel! I love writing in different genre. Historial can be tiring at times as I so ant every detail to be correct. Cosy dog crime - love it. Its my world - crime and dogs! Then that romcom - if people 'get' my humour I'm more than happy. I agree with Elaine - what have you got to lose? I write Regencies (another GH fan!) but I have also written a crime novel and am currently fantasising about a fantasy novel - I have the idea but still lack the courage to launch myself fully into it! Good luck, whatever you decide to do. And don't forget, if you don't think it's working, no one need ever read it so let your imagination soar! I did it! And it's painless. Moved from rom.com to historical mysteries, a couple of contemporary cosies and now I'm doing historical but not mystery. Much more fun than sticking to the same thing. Sounds as if you like variety, Nicola. Well, it seems I have put myself on the spot and will have to give it a go. Which one though? Hmmn! Left hand, right hand, left hand, right hand. I swapped to contemporary romance from YA, but they were all set in the present day so not as big a change as you're considering. With an historical background I've long considered writing a novel in that genre but have only ever got as far as a few short stories, which though brief still needed a lot of research! Good luck with whatever you eventually decide - I'm sure you'll do it well. Look forward to read back in class! Either I'll crawl off into a dark hole or I'll grasp the nettle. I'll make sure it's the latter. Did they use nettles for medicinal purposes in Regency times? I must check! Don't know about medicinal, but almost certainly for soup. Carmela made some once - very nice. Perhaps you could try a host of old recipes in the name of research! It's easy, Lesley. You give up everything else and survive on less sleep. What! You've done that already! Living in the past is great fun. There's always something new to learn and some fascinating ways in which the hero and heroine can be brought together and kept apart. You're right about the clothes thing, though. It's easy to get caught out by having the heroine whip off her gown without thinking that she probably needed someone to help her with buttons and laces. April, I'm going to have a lovely time rereading Georgette Heyer - all in the name of research of course! Go for it, Natalie! I was in your position at Christmas when my beloved editor suggested I submit a short story for Accent's Christmas anthology. I usually write historical romantic adventures so this was something new for me. I loved it and it was the start of my Polvellan Cornish Mysteries series. Now I'm alternating those with historicals. 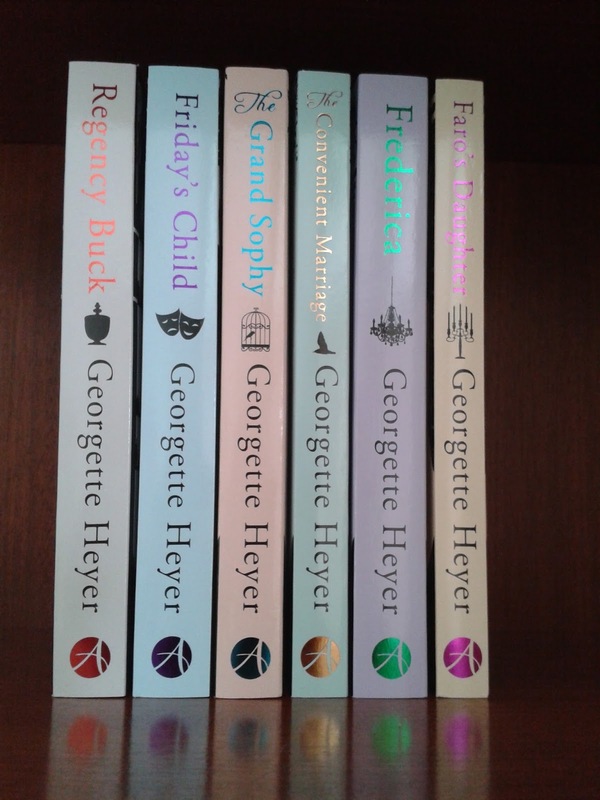 I'm a Georgette Heyer fan and have all her Recency romances. They are 1960's editions, my comfort reading, and very battered. Immerse yourself and enjoy! Such a tingle going on, Jane, just below the surface...but only just below. The Regency has won out over the time-slip but that's calling me too. Maybe next time. I know I've said it before but how lucky are we to be able to create out own worlds! I've changed genre several times. I started as a Regency romance writer - in the vein of Georgette Heyer (love her, by the way) - then wrote a time slip which moved between Victorian and contemporary London - and this year have published a trilogy (it's marketed as a saga but to me it's just women's popular fiction) set in the 1930s/40s. I'd love to have a go at crime, too, but I now have an agent whose advice is definitely NOT to change genres! My own feeling is that you should write what you feel impelled to write and then hope to find a market, but I know that's not the way it's done these days. Lovely to meet yet another Georgette Heyer fan - we are multitude, aren't we. Luckily my agent is yet another. Maybe it will work, maybe not, but I have to try. I'm going for it! I think you should go with it, Natalie. I agree that historicals involves more research but time slip is something I think would be fun. Good luck Natalie! I think it can be good to try something different - it keeps your brain going :-) I mostly write womag stories but have also been writing a much darker YA novel and although it's a steep learning curve it's also opened up a whole new world for me, both in reading and writing. Switching from one to the other can be refreshing if you get jaded. I agree, Lilian. I've had several short stories published and it's the scope and variety of those that has in part given me the courage to try something different. Your YA novel has obviously opened many avenues for you. If you want to write a Regency, you have a lot of lovely research ahead of you! It's not just knowing who did what when, it's knowing why, and why they thought that way, and it's a lot of fun! When I went into contemporaries, I didn't realise how much research was involved there, too, like which way the traffic flows in New York. Readers notice these things! You're right, Lynne, readers do notice - and we owe it to them (and to ourselves) to get is as right as we can. I put the word 'pants' in something recently instead of trousers and was asked if the person in question was an American. He wasn't but I had in fact put it there with the American market in mind. You have to be so careful.